First I tried it my intuitive way - and I got punished by the power-users here. The question of the OP was really regarding basics of VB. It was obvious that a short hint helps the OP to find the right way. It makes absolutly no sense to spend the effort to do a setup with that program (VB) used to take some screenshots and create a click by click tutorial. Why? Because the short hint takes a minute (question 22:03, solution 22:15) and OP can go on (and he did!). This is much more usefull for the OP than waiting hours for a video tutorial. Why? Because the supporter may spend the saved hours not doing a video turorial helping other users. As long as some of the big player here apply double standards it is annoying helping the OPs here. Let's zoom out a bit, and not go into all the details too much. Most of your annoyances are the result of the (mis-)conception that AU is some kind of a private help desk. Nothing is less true; both the person who asks a question and the person who answers, have the responsibility to make the post both useful and understandable, for as many people as the subject allows. Although we definitely want OP to find his or her solution, from the bigger perspective, the person, asking the question creates the occasion to answer the question. The consequence is that if a question also is applicable to a less experienced user, the answer should be accordingly, no matter if the question was asked by a 100k user or a 21- user. Of course if a question involves a highly complicated subject, we may assume the average visitor of the post will be more experienced, and the style of answering as well. I suggest you spend your energy on writing good, understandable answers, I am sure you can, rather than fighting a concept that is the result of general consensus, of which you can be part if you let go your personal annoyances. If my answer is tl;dr - check your attitude both with new users and high reputation users here at the door and learn from your down votes, review upvoted answers, and review the behavior of high reputation users. An explanation of the problem and solution. A graphical solution (very popular here) with screen shots. If the solution uses the command line, an explanation of the commands with a link or reference to the man page for details. Take a look at any user with a high reputation and review perhaps the top 5 answers that user posted. Other communities (Fedora, Arch, Gentoo, Slackware to name a few) are improving, but, often will post answers such as RTFM with more acceptance. Such a policy (RTFM) has advantages and disadvantages depending on the quality and maintenance of documentation but is not accepted here. Your attitude, however, would be fine in many irc channels or in other communities, just not Ubuntu. Third - Moderation on this site is community maintained so anyone can up or down vote your posts. You need to take a deep breath and not take such things personally. I know I have my share of what sometimes seems to be random drive by down votes. So what? Everyone has the right to agree/disagree with my suggestions. You should, however, review your posts if you get a down vote and try to improve. However the moderators have a light hand, lots of tolerance and patience, are for the most part community elected, and do a nice job of watching for stalking behavior, either good or bad (I have seen users deleted who the mods felt had a pattern of upvoting my answers -> loss of reputation for me). They manage problem users via the use of flags. So while we do not always agree on various actions, the site is run by consensus. This site actually permits directly copying something from the comments if it is believed to be the answer. Even if it ends up not being the correct solution, if it attempts to answer the question, the answer is valid and should not be downvoted, unless it is only a link, or has no details at all. Now, I agree with you that his answer is probably not a great solution, as it doesn't directly address the issue. However, it will most likely solve the problem by essentially resetting everything and starting over. It may not get upvotes, and it may be best to delete it, but it is technically an answer, and it is laid out in such a way that makes it easy to follow. You yourself admitted that it is more organized than what you suggested, which makes me think he didn't copy it directly from you (which is still perfectly OK). You also fail to provide an example of when you posted an answer exactly like that and it was criticized and/or downvoted. I am honestly not sure what you're saying here, so I can't provide a response to it. That question you are referring to is something that users do quite a bit. They "ask" a question and then answer it themselves. This is not for their use. It is a way of compiling information onto one site, Ask Ubuntu. If a user had a problem and solved it themselves by looking it up or figuring it out, they may think that others could benefit. Your answer here may be valid, but it is useless. The OP isn't looking for an answer, the OP is is sharing their knowledge with others. If their answer was just a one sentence thing, then it wouldn't help anyone looking for the answer. This user, by providing a lengthy answer, is not cluttering this site. This user, by providing a lengthy answer, is helping newcomers learn how to do something. A full blown tutorial is not spam. 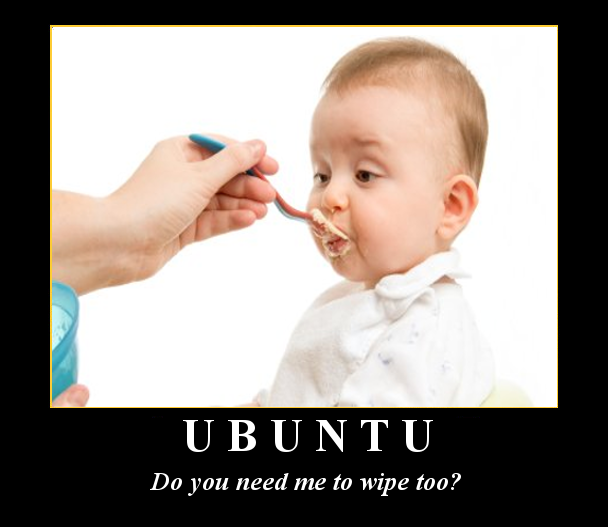 Please remember that Ask Ubuntu is a public site. Questions posted here should be problems that others could potentially have. Of course, unique issues are welcome, but not in every case. Answers need to also help others, and as such should not be created with only the OP in mind. If you have one sentence for an answer, someone else who comes along looking for the same solution might not have any idea what to do. This is why you are encouraged (and maybe obligated) to take some time to write out a full tutorial "for dummies." That way you can help more people than just the OP. Long, detailed answers aren't spam. They are actually much more useful than just "hints," as you call them. A "hint" shouldn't even be an answer in the first place, since "hints" don't answer the question. Leaving a hint is not an answer, this has nothing to do with super-users, the answer section is for answer not hints, leave hints in comments if you want. This site is for giving answers not hints, people don't come here for hints and tips they want an answer. You seem to think that as long as your hint may help someone sometime it is a valid answer, it is not. You seem to have an issue with inexperienced users while neglecting the fact that your answers should help anyone who comes across them not just the OP, that is how the site works, it is a data base of useful answer. Answers that just leave links like this open ssh connection in background don't answer the question and will/should be downvoted. In this one basel-real exists, but when I run basel, it said "No such file or directory" you say a user copied your comment, I see no evidence of this, the steps are different and the answer contains much more information than your comment, so how did they copy you? Also the answer is well written and contains clear steps, who told you not to do this?, no one, I read your other questions an Andrews answer fits the advice given to you there. You are starting to just post the same stuff again and again, please stop, it seems to be your personal vendetta about power users (does 7k make me a power user, I don't think so anyway) picking on you but in every example you give the other answers are better, if you have a better answer than an existing one, just post it, like others do.